Here we go again. This focusing mechanism from JMI Telescopes worked out so well on the Hα telescope that I decided to do the same thing on this one. 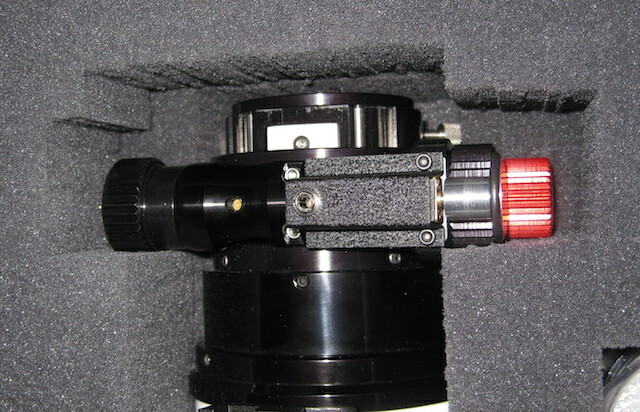 When I ordered this time the JMI folks contacted me to let me know that my model of Feather Touch focuser wasn't supported. I let them know that yes it was. So, same routine as last time. 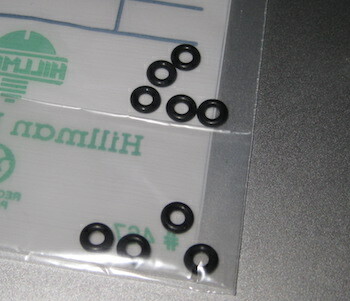 Replace the supplied silver screws with #4-40 3/8" long cap head screws, and put in a couple of stacks of o-rings. This time I found a large stash of them in town. I bought a few extras. I removed both knobs. Is that lithium grease? I just left it. When it starts to separate at least it won't drip inside the scope. The nylon collar slid on very easily this time. It was snug, but easy to get on. 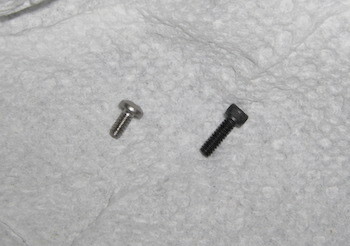 I got the flat part where the motor mounts in the right position and tightened the set screw. Once the collar was in place I put the knobs back on. 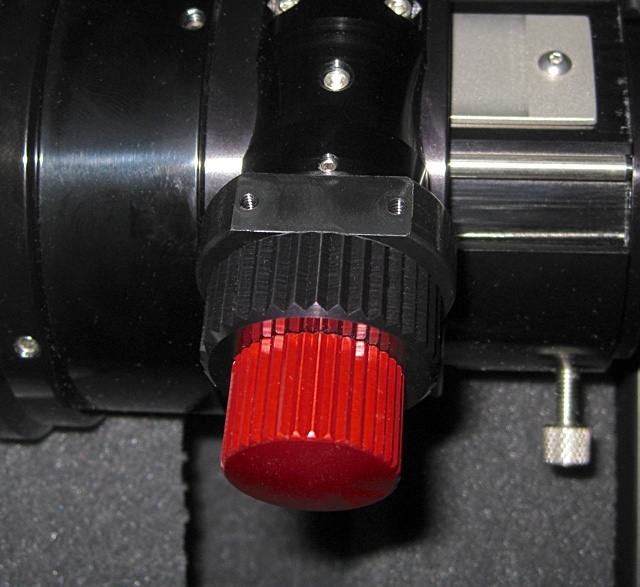 Don't get the red knob too close to the black one or you will spend 1/2 an hour trying to figure out why your smooth operating focuser is all-of-a-sudden rubbing like there is sand inside. Leave the thickness of a business card between them. Done. That was fast this time. 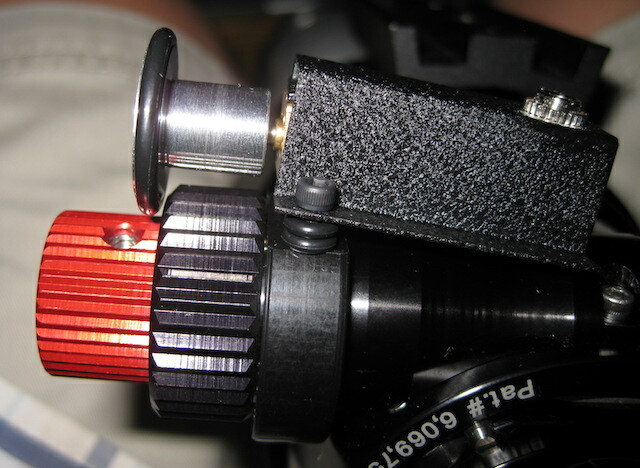 The rubber wheel hits at just the right spot to avoid the set screw pothole in the knob. 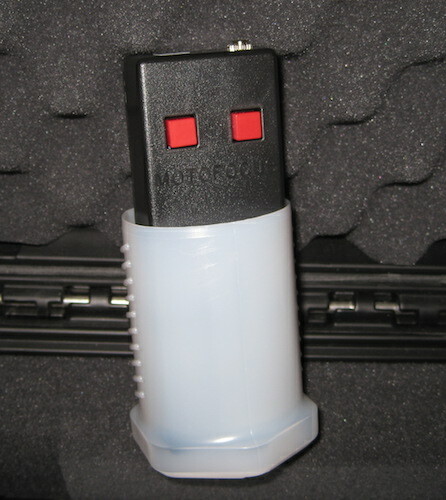 The connector for the coily cable that came with the motor this time was sealed up with a blob of glue. That's cheap. You can get the right connector that fits the wire. Oh well. I don't use the supplied coily cable. They are too short. I went to Walmart and bought a 6' long 3.5mm stereo audio cable. They pack better and are long enough. 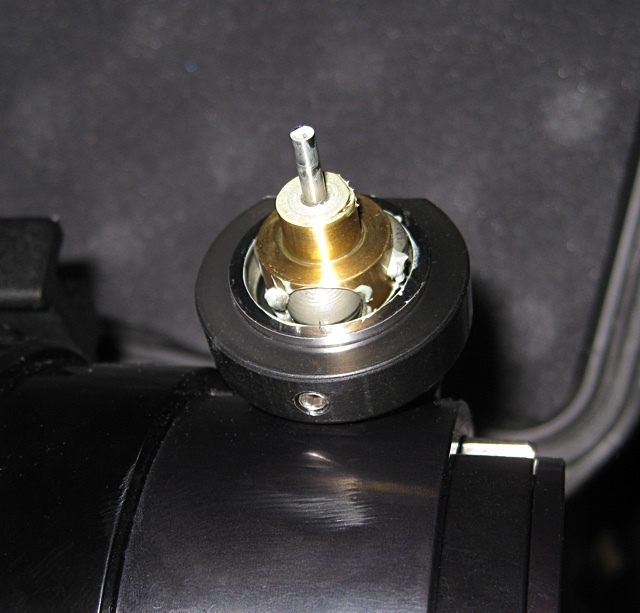 I stuck a pen between the motor housing and the focuser to engage the wheel and took it for a spin. It worked well. 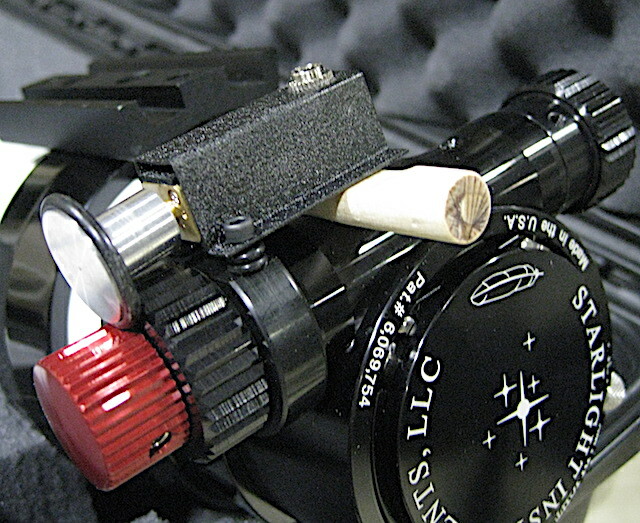 The telescope rides around in its Pelican case upside down, so I can use its dovetail on the bottom as a handle when taking the telescope out or putting it away. That means that the motor doesn't need to be removed for packing. I use a 52x80mm bolt case for the 6' cable and controller. What's nice about this is that when the bolt case is closed nothing will push the buttons on the controller and run down the battery. The curve of the case keeps them from touching anything. There's a 9V battery inside the controller. Time to make the clutch stick. 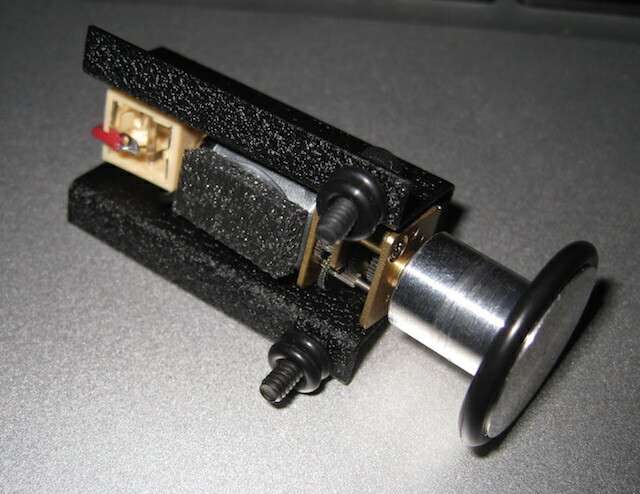 The one I made for the Hα focuser, the bottom one, always felt a little loose. It seemed to work fine, but it bothered me. So for this one I used a 7/16" diameter dowell, instead of a 3/8" one. A few seconds on the belt sander for the flat part, a few seconds on the sanding tube for the axel lock dip and cleanup, what seemed like an eternity with some sand paper, and it was done. I knew what I was doing this time, so it really only took a couple of minutes. Fits like a glove. 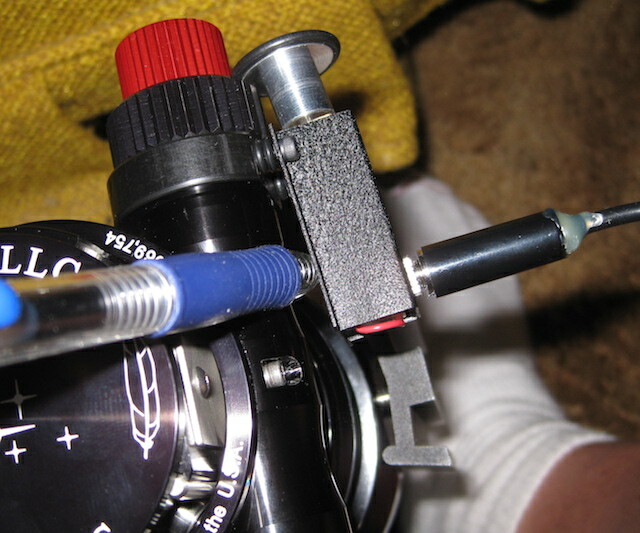 When slid into place the stick pushes up on the motor end and the wheel end goes down and presses on the knob. 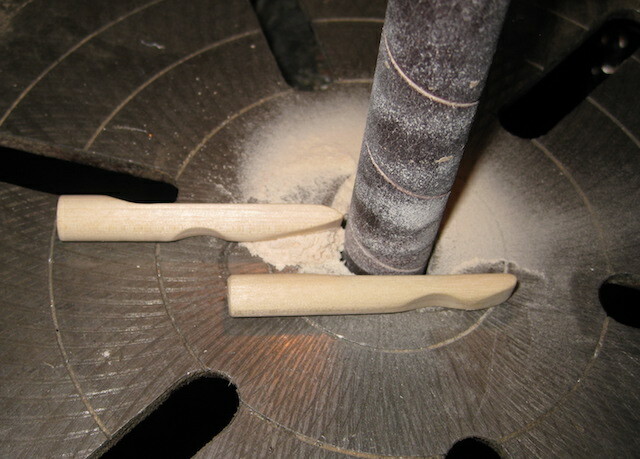 If it later seems like it is pushing too hard I can always sand the axel dip a little deeper.